cemetery | Mother of the Year... AGAIN! Auntie Kate has a special way about her. She has a gift of empathy, sympathy, imagination and storytelling. 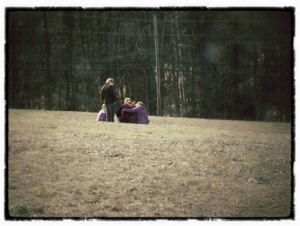 Here she is with three of the kiddos at the cemetery the other day. Now granted it looks barren without any stones near my Dad but as he would have said its “his real estate with a view”. He was quite proud of the way he positioned this bill of sale the day he drew up the papers. That empathetic view and creative way to talk about an uncomfortable thing… Much like Kate has and you can see it in this photo. By the end of their travels through the cemetery they had said prayers and visited children born over a hundred years ago, older folks, tragic high school deaths and more. I so wish with Kate’s gift we could write a book… Who knows who the audience would be but… I know if you eve read it you would just want more. Even my kids wanted more after spending that time with her and so many others she “got to know”. We have been pushing the “let’s build our town” and playing towns when we play. I’m not sure what to think because today Reilly said “I’ll be in the cemetery”. Hmmmmmm….